I’ve long been a fan of Brandon Stanton’s blog, Humans of New York*, for the thought-provoking profiles he captures that give us a glimpse into the characters that make up the U.S.A.’s most populous city. I was thrilled when Brandon announced his 50-day “World Tour” in partnership with the United Nations, aimed at raising awareness through a series of photos about the progress made towards the Millennium Development Goals. The photographs would achieve an important goal: humanizing these goals that represent a global effort to address those things that prevent human flourishing—maternal mortality, extreme poverty, lack of clean water. …with people fleeing war, it is absolutely impossible to discuss anything beyond the present moment. Their circumstances are so overpowering, there is absolutely zero room in their minds for any other thoughts. The conversation immediately stalls, because any topic of conversation beyond their present despair seems grossly inappropriate. You realize that without physical security, no other layers of the human experience can exist. This idea demonstrates one of our most significant challenges in eradicating poverty: violence that interferes with our global efforts to promote human flourishing. Obviously, the violence of war interferes, but perhaps harder to spot are the victims of what we at IJM have come to call ‘everyday’ violence—sexual assault, illegal land seizure, human trafficking. For millions, this violence is a present, everyday threat that keeps them from flourishing and obstructs our best efforts to eradicate extreme poverty, to provide clean water, to ensure universal primary education. The photo above reminds me of a different image—another photo of a mother sitting in a doorway—one that reminds me violence is certainly not inevitable. When Constance’s*** husband passed away, she was able to build a life for herself and her four children in the small home she and her husband had shared outside of Kampala, Uganda. But after her husband’s death, his relatives came to Constance’s home and announced their plans to sell it and keep the profits. Constance had no other place for her and her children to go. Constance contacted IJM, who represented her in a legal mediation. The relatives dropped their claim and agreed to sign a document declaring Constance as the sole owner of the property. Today, Constance is safe in her own home and lives with hope for a secure future. 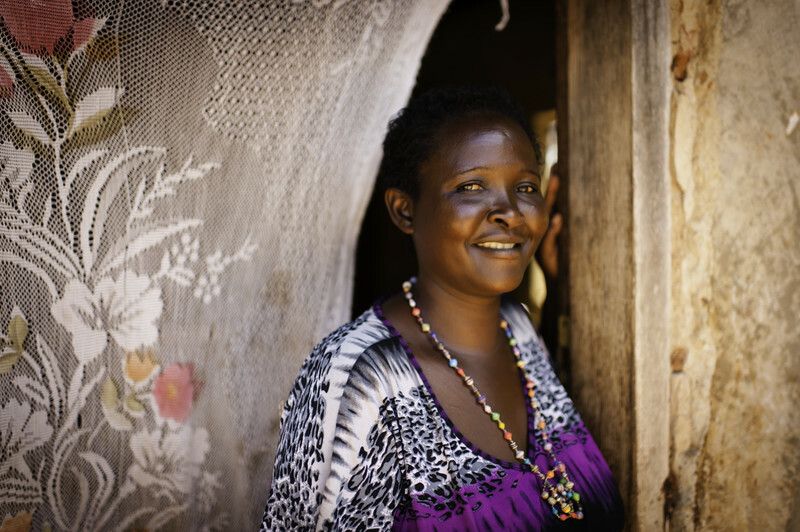 IJM was also able to help Constance start her own small business to provide for her family. When the threat of violence had been removed, Constance was able to flourish. The MDGs have brought much needed attention to important issues like poverty. They represent what is so moving about the images that are being shared on Brandon’s tour: a global coming together over our shared humanity. And they have made incredible progress in reducing the prevalence of poverty worldwide. As the UN considers its post-2015 development agenda, I hope it will include the need for protection from violence so perfectly captured in Brandon’s caption, so beautifully demonstrated in Constance’s story as a priority in the fight against poverty. Find out more and take action today. *Check out Brandon’s blog, Humans of New York – UN World Tour. **Here is the photo of the woman and her children in Iraq. This blog post was written as part of the digital rally MDG500. August 18, 2014 marks the 500 day milestone until the target date to achieve the Millennium Development Goals (MDGs), 8 goals established by the United Nations and governments around the world to tackle some of the world’s biggest problems. Join in around the world to raise awareness of the progress made through the MDGs and rally to continue the momentum.